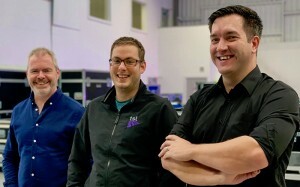 UK – Specialist lighting and rigging services provider TSL has announced the appointment of two of its highly experienced account handlers, Dominic Sheerman and Loz Wilcox, to its board of directors. The two respected event production professionals now join TSL’s founder and managing director Sam Tamplin in steering both the TSL and Blinding Light operations in their future growth. Sheerman and Wilcox joined the TSL family from Basingstoke-based conference and event lighting specialist Blinding Light in 2017, prior to its acquisition by TSL at the start of 2018. Since then, a successful period of integration has seen systems and processes aligned to the benefit of both operations. Now, the board appointments signal the beginning of the next phase of growth for the company. TSL and Blinding Light will continue to operate under their respective names and serving their respective customer bases, while benefiting from the added strength of the combined resources, management and processes of the expanded company. All members of the current team remain in place at both locations.